In spite of sustained attempts to build capacity, efforts have persistently fallen short of expectations in India and other developing nations. We need to re-examine, re-invent, re-imagine and re-double efforts to build capacity in various sectors at all levels. It is hard to overstate the importance of capacity building in nation building. Human capacity, above all, has been the key determinant in the rise and fall of nations. Even today, the race among nations is not necessarily won by those with most resources, but by those who have the capacity to make the most effective use of those resources. It is for this reason that the Paris Declaration on Aid Effectiveness, signed by more than 100 multilateral and bilateral donors and developing countries urged developing countries to make capacity development a key goal of their national development strategies. This is not empty talk – these donors have also put their money where their mouth is. Each year, they spend more than $20 billion to enhance the capacity of developing countries to make and carry out development plans. That level of commitment reflects donors’ belief that their mission will not succeed unless recipients improve their ability to use the assistance that donors provide, as well as the other resources at their disposal. There is an equally strong consensus among experts that in spite of sustained attempts over some time, efforts to develop capacity have persistently fallen short of expectations in India and other developing nations. Therefore, we need to re-examine, reinvent, re-imagine and re-double our efforts to build capacity in various sectors at all levels. This journey of change has to necessarily start with the identification of challenges that we need to overcome. Lack of clarity on the meaning of capacity building leads the list of challenges. As Lewis Carrol says in Alice in Wonderland, ‘If you don’t know where you are going, any road will get you there.’ Absence of an agreed definition of capacity has had a debilitating effect on the design of appropriate capacity building programmes and accountability for implementing them effectively. Second, a significant amount of capacity building activity in developing countries is supply-driven and not demand driven. Often, it is also donor driven. All this further contributes to the existing mismatch between supply and demand for appropriate capacity development. Third, most developing countries have not adopted an integrated systems-driven approach to capacity building. Like the government itself, efforts at capacity building often operate in silos and risk losing out on economies of scale and scope. Finally, while importance of capacity building is often recognised by governments, rarely do they hold the top accountable for delivering on this front.It is a task often delegated to the lower echelons. However, when the chips are down, this is an area where budgets are slashed first. Decision makers seem to get away with it as the benefits, in terms of monies saved, are immediate and obvious, whereas the cost of forgone capacity development is implicit and its negative impact is felt only in the long-run. A significant amount of capacity building activity in developing countries is supply-driven and not demand driven. Often, it is also donor driven. All this further contributes to the existing mismatch between supply and demand for appropriate capacity. Against this backdrop, the academic programmes at the Indian School of Business (ISB), seek to build required capabilities, expertise and thought leadership in several areas including Public Policy,Infrastructure, Manufacturing and Healthcare. For the past many years, the Centres operating out of the Hyderabad campus, and the four Institutes at the Mohali campus, have built a sizeable thought leadership on capacity building in these four areas. Healthcare is an area where ISB faculty have built considerable thought leadership over the years. This is now being supplemented by the Max Institute of Healthcare Management which is also conducting programmes for building management capacity in the healthcare sector. 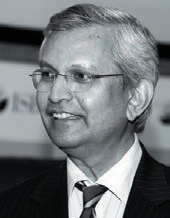 The first of these cover stories, Cost Efficiency plus Quality Measures: Prescription for the Indian Healthcare Sector, by Professor Pierantonio Russo, Guest Faculty, ISB & Wharton, explains how the healthcare capacity conundrum in India can be addressed through a consumer driven approach. This has to be based on a meaningful comparison of individual providers and facilities on risk adjusted analysis apart from focused collaboration between private and public providers in the country. Capacity building for creating world class infrastructure is a core issue impacting development. And in the current context, building Smart Cities is a topical issue, thanks to the Government’s 100 Smart Cites Initiative. Hence ‘Capacity Building for Smart Cities’ authored by O P Agarwal, Executive Director, Punj Lloyd Institute of Infrastructure Management, figures as part of these cover stories. It highlights what a capacity building exercise should include and suggests an architecture for the successful implementation of the 100 Smart Cities Initiative. Finally we have ‘Minimum Government, Maximum Governance: From Rhetoric to Reality’ a paper by Mandar Kagade, Analyst at the Bharti Institute of Public Policy, setting the context for discussions on policy issues related to lean governance, quicker decision-making, faster delivery of services and reduction in bureaucracy. The paper focuses on how governance can be people centric while also being more efficient. Papers included in this volume support programmes and policies for creating a strong infrastructure, an aggressive manufacturing sector and a healthy and skilled workforce. We believe that with effective public policy, we can evolve into a sustainable model of development for near double digit growth rates in the coming years. Notwithstanding the indications of slower than expected growth rates, the International Monetary Fund (IMF), expects India to retain its recently acquired status as the world’s fastest growing major economy in the current fiscal with a 7.3 percent GDP growth forecast. However, I hasten to add, IMF stressed on the need to roll out the next phase of economic reforms and to further improve its business climate for achieving faster and more inclusive growth. Clearly there is a case for a more focused debate on capacity building for better governance including mechanisms for improved investment climate and ease of doing business at both the Centre and States, speedier build-up of infrastructure, better healthcare delivery and a more robust manufacturing sector. The papers in this issue of ISBInsight provide a sampling of the issues involved in these areas in an attempt to provoke and stimulate debate ahead of the ISB National Conclave on December 3, 2015. Further, the Conclave itself is expected to provide a larger platform to carry forward this debate.